“Open borders” is the agenda of many mass immigration promoters. The idea is that anyone from abroad who wants to cross our border and settle in the United States should have the right to do so. But aside from zany libertarians, most of these advocates don’t explicitly endorse what they believe because they know how preposterous it sounds to most people. Sometimes they are globalists who are advancing political and economic goals at odds with the interests of most of their fellow citizens – thus the need to conceal their aims. My post today is inspired by the elite commentary, “The Right Way to Ask Boomers to Retire / How ‘Polite’ Millennials Can Convince a Generation of Workaholics to Give Up Their Jobs,” by Mike Hais and Morley Winograd (September 29, 2014, Zocalo Public Square). I’ve included my two comments to the article and the author response. My post then follows. Imagine my profound unhappiness when I got into a Washington D.C. taxi and was immediately barraged by a televised amnesty advertisement. 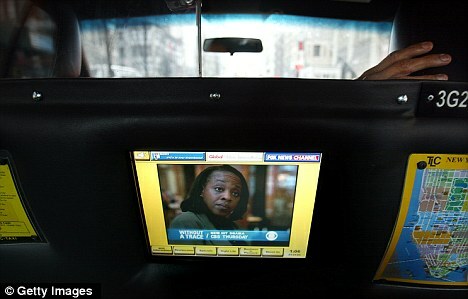 Taxis are used to promote amnesty. Is there nowhere to escape immigration lobbying?